The bind off (BO) is a similar action to the PSSO (pass slipped stitch over). The end of every project is a bind off. English style not your thing? Check out how to perform the PSSO stitch continental style. The K2tog (knit two together) decrease stitch has a particular slant. The SSK (slip slip knit) creates a stitch that slants in the opposite direction. The front of a stitch is where you usually knit or purl into. If you knit into the front and then the back of the same stitch, you get 2 for the price of 1! 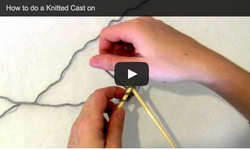 If you know the knit stitch then you can perform the knitted cast on. After knitting a stitch you just slip it back to the LHN (left hand needle) instead of to the RHN (right hand needle). Almost every knitting project starts with a slip knot stitch before a cast on. The slip knot is used so the loop will tighten just enough around the knitting needle.